The new statutes of the ESP went into force on 30.09.2013 before a Belgian notary. 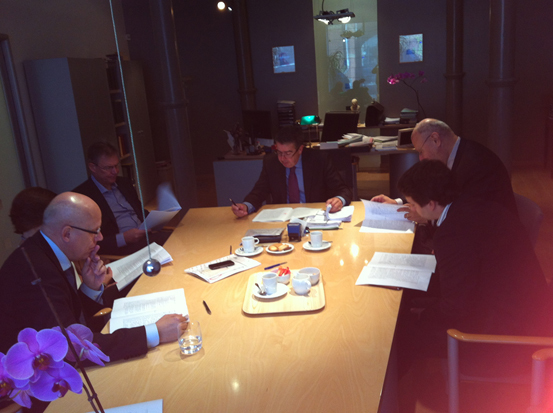 The ESP Officers of the Executive Committee are finalizing the formal changes in the Statutes with the notary in Antwerp. Members of the ESP are encouraged to submit proposals for changes in these documents to the Secretary. You may consult the Statutes and bylaws of the ESP below or you may download the document here. The society was founded on November 7th 1964 as an “international society with humanitarian, religious, scientific, artistic and educational aim” under the name “Société Européenne de Pathologie”, in accordance with the Belgian law of October 25th 1919 regarding the attribution of legal entity to international societies with humanitarian, religious, scientific, artistic and educational aim. The legal entity of the society was attributed by Royal decree of February 9th 1970. The current name of the society is “European Society of Pathology” or, abbreviated, “ESP”. The working language of the society is English. Since the Belgian law of May 2nd 2002 concerning non-profit societies, international non-profit societies and foundations, the society is subject to title III international non-profit societies of the Belgian law of June 27th 1921 concerning non-profit societies, international non-profit societies and foundations. The seat of the society is at Barastraat 6, 1070 Brussels (Anderlecht). The seat can be moved to any place in Belgium following the decision of the Council of the society. The society is a non-profit society. The aims of the society are to advance pathology in Europe and to facilitate communication between European pathologists. The term pathology includes all aspects of anatomic pathology. In order to achieve this aim the society will organise courses and congresses on a regular basis. The society will accept Belgians and persons of other nationalities. The number of members is unrestricted, but is at least 30. The society will consist of ordinary, trainee, retired and honorary members. Ordinary members are pathologists and any other person, usually a medical, dental, veterinary or science graduate, who is or has been engaged in research and/or in teaching in connection with pathology. Trainee members are physicians in post-graduate training in pathology and post-graduate students with a special interest in pathology. Honorary members are persons with meritorious achievement in medicine, biology, or any field directly related to pathology or the society. Retired members are ordinary members who have obtained retired member status upon a request by letter, e-mail or any other means of communication to the Treasurer. Ordinary and trainee members are accepted by the Treasurer upon submission of an application form to the Administrator of the society. Applications by a trainee shall be accompanied by a document stating the trainee status including the expected date of completion of training. In case of a rejection of a membership application a reasoned decision shall be made by the Council. Membership is dependent on payment of the appropriate annual membership fee. Ordinary and trainee members may vote at the General Assembly and serve on committees, commissions and working groups. Honorary members are elected by the General Assembly following nomination by the Council. Honorary members may participate in the General Assembly, but have no vote. Honorary members may be appointed to commissions or working groups. Retired members may participate in the General Assembly, but have no vote. Membership can be terminated by letter, e-mail or any other means of communication to the Treasurer. Exclusion of a member can only be decided by the General Assembly, after a proposal by the Council and provided the General Assembly is regularly convened and the item is on its agenda. The General Assembly can only decide to expel a member if at least 5% of the voting members of the society are present or represented. A decision to expel a member must be taken by a majority of two thirds of the voting members present and represented at the General Assembly. If less than 5% of the voting members of the society are present or represented, a new meeting of the General Assembly will be scheduled under the same conditions as the above-mentioned, and this General Assembly can take a final and valid decision on the proposal after approval by a majority of two thirds of the members present and represented. The member in question has the right to be heard by the Council. Ordinary and trainee members pay an appropriate annual membership fee. The annual membership fees are determined by the Council on the advice of the Treasurer. Honorary and retired members shall be exempted from paying a membership fee. The General Assembly is the supreme body of the society. It supervises the activities of the Council and the Executive Committee. The General Assembly has the sole authority to change the statutes. The General Assembly has the sole authority to approve and to change the bylaws. The General Assembly has the sole authority to appoint and to dismiss officers of the Executive Committee, members of the Council and the Chair of the Advisory Board. The General Assembly should approve the report of the President, as well as recommendations of the Executive Committee, the Council and the Advisory Board. The General Assembly should approve the financial report presented by the Treasurer, including the audited accounts, and the budget of the following year. The General Assembly has the sole authority to recognise the working groups of the society. The General Assembly may appoint committees or task forces. The General Assembly has the sole authority to expel members. The General Assembly has the sole authority to designate the venues of the forthcoming congresses of the society. The General Assembly has the sole authority to adopt the official journal of the society. The General Assembly has the sole authority to dissolve the society voluntarily, and to decide on the way the society will be liquidated and its assets disbursed. The General Assembly is composed of all members of the society. Ordinary and trainee members have one vote each, while retired and honorary members have no vote but may participate in the General Assembly. A member who holds a specific mandate may represent other members at the General Assembly. The General Assembly meets at each European Congress of Pathology and is chaired by the President of the society. An extraordinary General Assembly may be called by request of one third of the members of the society. A notice of the meeting is sent out by the Secretary in the Newsletter, by e-mail or any other means of communication at least two months prior to the meeting. The working language is English. 4. Decisions Valid decisions can only be made on items mentioned in the agenda. The General Assembly can only make valid decisions if at least 5% of the voting members of the society are present or represented. All issues not specially provided for in these statutes shall be decided by a simple majority of the voting members present and represented at the General Assembly, the President having the casting vote in the event of a tie. If less than 5% of the voting members of the society are present or represented, a new meeting of the General Assembly will be scheduled under the same conditions as the above-mentioned, and this General Assembly can take a final and valid decision on the proposal after approval by a simple majority of the members present and represented, the President having the casting vote in the event of a tie. The decisions of the General Assembly are minuted, signed by both the President and the Secretary, and made available to the membership through the website of the society. Any proposal to change the statutes or to dissolve the society shall be initiated by the Council, the Executive Committee, or at least 25% of the voting members of the society. Initiatives by voting members shall be submitted in writing to the Executive Committee to be included in the agenda of the General Assembly. The General Assembly can only make valid decisions if at least 25% of the voting members of the society are present or represented. A decision to change the statutes or to dissolve the society must be taken by a majority of two thirds of the voting members present and represented at the General Assembly, the President having the casting vote in the event of a tie. If less than 25% of the voting members of the society are present or represented, a new meeting of the General Assembly will be scheduled under the same conditions as the above-mentioned, and this General Assembly can take a final and valid decision on the proposal after approval by a two thirds majority of the members present and represented, the President having the casting vote in the event of a tie. An electronic voting procedure may be used. This procedure must be determined by the Council and must enable the identity and capacity of every voting member to be verified. The electronic voting form should indicate the identity of the voting member and his domicile, the agenda of the General Assembly, the proposed decisions (yes, no, abstention) and the ultimate date and hour by which the society must have received the vote to be valid. To calculate the rules of quorum and majority prescribed by this article, only valid electronic votes will be taken into account. For the approval of modifications which require attendance of a notary and which have already been informally decided during a previous meeting of the General Assembly, the members can appoint one or more attorneys-in-fact to vote on their behalf for their formal approval in a meeting held before the notary. In this particular case, there is no limitation to the number of proxies the attorney-in fact can exercise. In the event of dissolution and liquidation of the society, the General Assembly will decide upon the allocation of the assets remaining after the liabilities of the society have been settled. The remaining assets must be dedicated to a non-profit purpose as similar as possible to the purpose of the dissolved society. The General Assembly will appoint at least three liquidators, who are preferably but not necessarily members of the Council or the Executive Committee. Between General Assemblies, the society shall be administered by the Executive Committee and the Council. The Executive Committee possesses full powers of management and administration, except for the functions assigned to the Council or to the General Assembly. The Executive Committee may delegate the management of day-to-day affairs and particular specified functions to its President, another member of the Executive Committee or a third person. assistance to the actions of the Executive Committee, particularly in decisions of strategic impact for the organisation of the annual congresses, or any other large events organised by the society. The Executive Committee is composed of at least five officers, i.e. the President, the President – elect, the immediate Past President, the Secretary and the Treasurer. The Council is composed of at least 13 members, namely the Executive Committee and at least eight other society members. Members with specific functions of the society may be co-opted to the Council, but have no vote. Nominations for both the Council and the Executive Committee will be sought from the membership by an announcement in “The Newsletter”. The Council will make nominations for members of the Council and the Executive Committee. Members of the Council and the Executive Committee are elected by the General Assembly for one period of four years, but only the Secretary and the Treasurer can be elected for a second consecutive four-year term. The President is elected for a term of 2 years as a President-elect, followed by a two-year presidency, and a 2-year term as Past President. The officers and the members of the Council can be dismissed by the General Assembly. The General Assembly can only decide to dismiss an officer or a member of the Council if the quorum and procedure required by article 7.4 are fulfilled. Their function will also be terminated by death, resignation, legal or other incompetence, severe incapacity of health, dismissal or end of the term of office. If an officer or a member of the Council prematurely terminates his/her function, the Council can elect a replacement. For this, the Council can be assisted by the Advisory Board composed of members representing the national societies. The Chair of the Advisory Board is indicated by the Council of the society for a term of four years, subject to the approval of the General Assembly. An officer or a member of the Council can only act as a proxy for one other member of the Council. The Council meets as necessary and at least twice a year. Notice of the meeting will be circulated by the Secretary by letter, e-mail, or any other means of communication, at least one month prior to the meeting. The Executive Committee meets as necessary, either ‘live’ or by using any communication method deemed necessary. The Council can only make valid decisions on items mentioned in the agenda and if at least two thirds of the members are present or represented at the meeting. All issues shall be decided by a simple majority of the members of the Council present or represented at the meeting, the President having the casting vote in the event of a tie. If not at least two thirds of the members of the Council are present or represented, a new meeting of Council will be scheduled under the same conditions as the above-mentioned, and at this meeting the Council can take final and valid decisions on the proposal after approval by a simple majority of the members of the Council present or represented, the President having the casting vote in the event of a tie. The decisions of the Council are minuted, signed by both the President and the Secretary, and archived by the latter. Valid decisions of the Executive Committee can be taken if at least half of the officers are present or represented. Decisions shall be taken by a simple majority, the President having the casting vote in the event of a tie. Officers can be represented by other officers, or can be present by phone (conference call) or any other means of communication approved by the Executive Committee. Meetings and decisions of the Executive Committee shall be minuted and the minutes shall be distributed to members of the Council, insofar as this is required by the President. Besides the Executive Committee and the Council, the society has an Advisory Board. The Advisory Board will act as an advisory body to the Council and the President, and will be composed of one representative from every national society of pathology affiliated with the society. These national societies are invited to nominate one member each to the Advisory Board. The Chair of the Advisory Board, preferably a Past President, will be nominated by the Council, upon proposal of the President. Nomination of the Chair is subject to approval of the General Assembly. The Chair of the Advisory Board will serve for a non-renewable term of four years. Without prejudice to the possibility for the Executive Committee as a body to represent the society and without prejudice to the possibility for the Executive Committee to give special powers of attorney, all acts binding on the society are signed by the Secretary and the President together, who do not need to provide proof of their authority to a third party. All legal proceedings, including the entering into and the prosecution of a lawsuit, are conducted, both as a plaintiff and as a defendant, by the Executive Committee represented by the President or a member of the Executive Committee designated by it for the purpose. The financial year begins January 1st and ends December 31st. The budget and accounts of the society shall be submitted annually for provisional approval of the Council and the General Assembly. The Dutch version of the statutes is the only official version. All cases not provided for by the present regulations and particularly announcements to be made in Annexes to the Belgian Official Gazette (“Bijlagen bij het Belgisch Staatsblad”) shall conform to provisions of Belgian law. This document describes the internal rules of the European Society of Pathology (further ESP or the society). Further details are available in standard operating procedures at the office of the society. The society is composed of four classes of members: ordinary members, trainee members, honorary members and retired members (Statutes, Article 4). The designation of such classes shall be set forth by the Statutes of the society. Membership can be gained on an individual basis or as a collective member. A group or all members of any national society may request collective membership. Collective members have the same rights and obligations as individual members. Names of the ordinary members, honorary members, retired members, and trainee members will be published on the website of the society and can be accessed by all members. Without formal approval from the Secretary of the society the membership list cannot be released to a third party. Ordinary members of the society are pathologists and any other person, as a rule a medical, dental, veterinary or science graduate who is or has been engaged in research and/or in teaching in connection with pathology (Statutes Article 4). The annual dues for ordinary members will be set by the General Assembly following a proposal by the Treasurer and the Council. Ordinary members will receive the official journals and will benefit from reduced registration fees for congresses, meetings and courses of the society. Retired members are exempted from membership fees. They will not receive the official journals but will benefit from the reduced registration fee for congresses, meetings and courses of the society. A nomination for honorary membership can be made by or on behalf of any member of the society, via an officer or a member of the Council. Following approval of their nomination by the Council, honorary members will be proposed for election by the General Assembly and will be elected by simple majority. Honorary members shall be exempted from paying the membership fee and the registration fee of the annual congresses, and will receive the official journals and publications. The annual dues for trainee members will be set by the General Assembly following a proposal by the Treasurer and the Council. On completion of the training program, trainee members will normally become ordinary members of the society. The time and place of the meeting of the General Assembly will be published in the final congress programme and its agenda will be provided to all members of the society through the newsletter at least one month before the meeting. If the meeting of the General Assembly is not attended by at least 5% of the ordinary members of the society, a new meeting of the General Assembly will be summoned under the same conditions as the above-mentioned, 15 minutes after the first one, and this assembly can take final and valid decisions. No other congress activities should take place during the meeting of the General Assembly. General responsibilities of the Council. The Council will fulfill its functions as stated in the statutes (statutes Article 9) as well as: 1. Propose the place and time of each scientific meeting and congress according to the requirements for hosting such events (Bylaws, Article XI). The General Assembly has the sole authority to designate the venues of the forthcoming congresses (Statutes, Article7). 2. Propose candidates for the officers of the society and for members of the Council to the General Assembly (Bylaws, Article III). 3. Appoint the Chair of the Advisory Board, subject to approval of the General Assembly (Statutes, Article 9). 4. Appoint the Chair of the Education Subcommittee, ratify its composition, terms of reference, and the course programmes (Bylaws, Article VI). 5. Determine the method of conducting a ballot. 7. The members of the Council shall assume responsibility for defined portfolios (such as the website, the newsletter, the education portal) and discharge such other duties, submit reports and take other actions as the President or the Council may delegate to or request of them. 8. An elected member of the Council shall chair the Education Subcommittee. If the appointed Chair is not an elected member of the Council, he/she will be an ex-officio member of the Council. 1. Nominations will be sought from a variety of sources including the President, the members of the Council and the Advisory Board, and a call for nominations in the Newsletter. A nomination by a society member must be seconded by at least one other member. 2. Nominations will be sent to the Secretary. 3. The Secretary will present them to the Nominations Subcommittee for comments and advice. The nominated individuals must approve their own candidature and provide an abbreviated CV. 4. The Council will discuss the nominations, taking into account geographical and subspecialty factors to ensure wide representation of the membership at large. 5. The Council will decide and, if necessary, vote (by simple majority) on the proposals. 6. The recommendations of the Council will be published in the Newsletter and on the website of the society. 7. The recommended candidates will be presented for formal approval at the General Assembly. The General Assembly must approve that the procedure for choosing the new members of the Council was correctly carried out. Further candidates cannot be proposed at the General Assembly. 1. The Chair of the Advisory Board with voice but no vote. 2. The Editors of the official publications of the society and the Chair of the Education Subcommittee. This category of participants will be present in general only for those parts of the meeting of the Council pertaining to their responsibilities and will have voice but no vote in decisions of the Council. 3. the Chair of the UEMS pathology council with voice but no vote. 4. the Chair of the EAPCP council with voice but no vote. 5. the Chair of the Trainee Subcommittee with voice but no vote. 1. Conduct the day to day management of the society. 2. Prepare the meetings of the Council, as well as prepare and follow up all activities of the society under the supervision of the Council and the General Assembly. 3. Decide on the staffing requirements of the society. 4. Prepare any changes to the Statutes and Bylaws of the society. 1. The President shall preside over all meetings of the society, the Council and the Executive Committee. In the case of absence or disability of the President, the President-elect shall assume such duties. 2. The Secretary shall be responsible for maintaining the office of the society. He/she will circulate the agenda and announce all meetings of the Council, the Executive Committee and the General Assembly. Furthermore, the Secretary shall be responsible for carrying out the business of the society and for implementation of all policies and actions of the Executive Committee, the Council and the General Assembly. 3. The Treasurer shall collect dues and any other funds, and is responsible for handling the financial transactions of the society. The Treasurer is responsible for organising the annual audit of the accounts of the society, for submitting the annual financial statement to the Executive Committee, the Council and the General Assembly; for proposing the annual budget to the Executive Committee, the Council and the General Assembly, and for taking care of all legal formalities of the accounts. 4. In the event of absence or disability of the Secretary or the Treasurer, one of the members of the Executive Committee or the Council shall take over the duties of the Secretary or the Treasurer until the next General Assembly, subject to approval by the President. 5. Every year the Treasurer shall update and publish on the website of the society a list of all members. 6. The immediate Past President shall preside over the meetings of the Chairs of the Working groups. 7.The ESP shall have an office in Brussels. Functions of the office employees will be approved by the executive committee. Proposals by the Nomination Subcommittee for the President-elect, Secretary and Treasurer will be made taking into account scientific, subspecialty and geographical considerations so as to maintain a balance between all European countries. 1. The President will ask for the advice of the Nomination Subcommittee (active past presidents) on proposals for candidates for each post. 2. The proposals and the opinion of the Nomination Subcommittee will be presented to the Council. 3. The Council will discuss and vote (by simple majority) on these and any other proposals. 4. The Council will recommend a candidate for each post to the membership at large. The nominated individuals must approve of their own candidature and provide an abbreviated CV. The recommendation will be published in the Newsletter and on the website of the society. 5. The published recommendation will be accompanied by a call for other nominations. Such nominations must be approved by the individuals themselves and each nomination must be supported by a substantial number of members of the society (at least 5%), and accompanied by an abbreviated CV of no more than one page. 6. Six weeks later: Option A: No additional nominations. Option B: i. One or more correctly proposed nomination. ii. A general ballot must be held (by postal, electronic or secret vote of members at the next annual congress). The method of conducting the ballot will be determined by the Council. iii. The successful candidate will be elected by simple majority. 7. The successful nomination will be presented to the General Assembly for approval. 8. The General Assembly must approve that the procedure for choosing a new officer was correctly carried out. Other candidates cannot be proposed at the General Assembly. The Executive Committee will meet when necessary at the request of the Council or one of the officers. Such a meeting may be held ‘live’ or using any method of communication deemed suitable. The Advisory Board will act as an advisory body to the Council and the President, and will be composed of one representative from every national society of pathology affiliated to the society. These national societies are invited to nominate one member each to the Advisory Board. The Chair of the Advisory Board will serve for a non-renewable term of four years. The Education Subcommittee will organise postgraduate courses and continuing education in pathology within the framework of the European School of Pathology (EScoP). E-learning programmes and an educational platform are also responsibilities of the Education Subcommittee. The Chair and at least one other member of the Council and two non-Council members will be members of the Education Subcommittee. If the appointed Chair of the Education Subcommittee is not an elected member of the Council, he/she will be an ex-officio member of the Council. The Chair of the Education Subcommittee is appointed by the President in consultation with the Council and the Working groups. Nominations for members will be solicited from the Working groups. Members of the Education Subcommittee will be elected for a period of four years. The Education Subcommittee will have an annual budget based on a proposal of the Chair, and approved by the Council. EScoP courses will be co-financed when necessary by the Education Subcommittee budget. The organisers of other courses may seek external financial support for their courses. For such courses the European Society of Pathology will not be responsible for any financial problems incurred by the organisers of these other courses. The Chair will give an annual report to the Council on the activities and finances. The Nomination Subcommittee consists of the former Presidents of the society, and is chaired by the immediate Past President. The Nomination Subcommittee advises the President and the Council in nominating candidates for officers and members of the Council. In its nominations, the Subcommittee will maintain a balance between the various European countries. A Trainee Subcommittee consisting of at least six residents in pathology representing various geographical regions of Europe will interact with the Council in all matters pertaining to postgraduate training. The Trainee Subcommittee will contribute to annual congresses by organising an annual trainee symposium. The nominated Chair will be an ex-officio member of the Council. The Chair of the Trainee Subcommittee is appointed by the President in consultation with the Council and the Advisory Board. Following a proposal from any member of the society, the Council may appoint permanent or temporary subcommittees as deemed necessary or helpful in achieving the goals of the society. The Council will determine the way in which these subcommittees operate. The duration of temporary subcommittees will usually be limited to the four year period of the Council. The society shall encourage the formation of subspecialty and special interest Working groups that will, under auspices of the society, organise courses and meetings both at and between the congresses of the society, as well as collaborative inter-institutional projects as considered appropriate by the members. They will provide programme proposals for the annual congresses. The formation and continuing function of Working groups are subject to the approval of the Executive Committee, the Council and, in turn, the General Assembly (Statutes, Article 7), and are contingent on advice from the Advisory Board. For certain subspecialties, existing societies can be affiliated to the society after approval of the Council, and may then serve as de facto Working groups. Individual Working groups have discretion as to their own structure. Each member of the Working groups must be a member of the society. The annual membership fee of the society includes participation in all Working groups. a. A description of the structure of the Working group. b. An annual report of the Working group´s administrative and scientific activities. d. Announcements of future events and/or activities. B. sending a short administrative report and an updated list of the members of the group to the Secretary and the immediate Past President (Chair of the ESP Working Groups) three months before each congress. 2. The Chairs of the Working groups or their representatives will have an annual business meeting under the chairmanship of the Past President of the society, and with necessary secretarial support from the society, at the congress. The officers and the Chair of the Advisory Board will also be invited to attend such meetings. 3. The Working groups as a rule cannot be affiliated to any journal other than the official journal(s) of the society. Exceptions are to be decided upon by the Council. Chairs of the Working groups are elected by the members of the Working group on a biennial basis. The Chair serves as a rule for a 4 year term. The Working groups will have an annual budget from the society. The Working groups may also seek external financial support for their meetings. The society will not be responsible for any financial problems incurred by the Working groups. The Chair will give an annual report to the Council on the activities and finances of the Working group. The society organises an annual congress. The Council may consider joint congresses with other societies of pathology. The annual congress shall be called "The European Congress of Pathology" with a serial number. The responsibility of the society in organising the congress shall be clearly indicated in congress announcements, posters and programmes. An adequate geographical balance regarding congress sites will be maintained. As a rule, the congress will take place in September. Countries not belonging to Europe in a geographical sense but from which pathologists maintain close ties with European pathology may be candidates for hosting congresses of the society. European national societies or divisions of the International Academy of Pathology wishing to host a future congress may submit a written letter of intent to the Council to organise an annual congress preferably 6 but not more than 7 years prior to the proposed congress date. Letters of intent will be submitted by the society to the CPO for assessment of suitability of the proposed venue. The Council will decide upon suitability based on the advice of the CPO. Those national societies whose letter of intent has been approved will be invited to present a full proposal to the Council which will decide upon the proposals, to be finally approved by the General Assembly. Proposals that are not accepted can be resubmitted a year later. The programme of each annual congress will be developed by an ad hoc scientific committee. The committee will be composed of three members to be appointed by the organising national society, the acting President, the Chair of the Working group Chairs, and the Chair of the Advisory Board. For joint congresses, specific rules may be applied depending on the requirements of the co-organising society. A congress budget will be prepared by the CPO chosen by the society, and will be presented to and approved by the Council. The society bears full financial responsibility for the organisation of the congress. Any profit generated by a congress can be shared between the society and the local organiser. Decisions as to eventual sharing of profits will be taken by the Council as part of the financial report of the congress. A clear distinction should be made between the registration fees for members, trainee members and non-members. Only members will qualify for the reduced registration fees. Past Presidents and honorary members of the society are exempted from paying the registration fee. The officers (President, President-elect, Secretary, Treasurer and immediate Past President) are exempted from paying the registration fee, and should be offered accommodation by the society. All other members of the Council, the Chair of the Advisory Board and the editor(s) of the Newsletter should pay their registration fee and might be reimbursed by the society if there is a surplus from the congress. For invited speakers who are not pathologists, special registration fees may be offered, as for example one day registration, a specially reduced fee or waiving of the registration fee. An official letter of invitation for the congress should be sent by the CPO to the officers and members of the Council, the Editor(s) of the Newsletter, the Chair of the Advisory Board, honorary members and Past Presidents. The society publishes an electronic newsletter under the heading ‘Society Newsletter’. The newsletter will be published at least 3 times a year. The Editor of the Newsletter is appointed by the President in consultation with the Council and becomes an ex-officio member of the Council (if not already an elected member). The official journal of the society is Virchows Archiv. The Council is responsible for the contractual arrangements with the publishers. The Editor in Chief of the official journal will be appointed by the Council for a three year renewable term in an open application process taking into account the recommendations of the Editorial Committee. The responsibilities of the Editor in Chief will be to determine and conduct the editorial policy of the journal in an open communication with the Council. Members of the Editorial Committee (Managing Editors) and of the Editorial Board will be appointed by the Editor in Chief. The society may affiliate with additional scientific journals that publish in the field of pathology. Any affiliation will be established by a contract which has to be approved by the Council and ratified by the General Assembly (Statutes, Article 7). Members of the society will receive special rates for the official journal. The Council will determine the society’s publication policy, and will submit the undertaking and/or discontinuance of the same to the General Assembly (Statutes).